April 2014 edition of our newsletter featuring news for geriatric professionals. Congratulations to the 2014 Salute to Senior Service® Contest winners! These inspiring seniors have won donations to their favorite volunteer organizations in recognition of their service. Communication is key to excellent senior care, but that task is much easier said than done when you're one of many members of a senior's care team, including doctors, family members, social workers and others. To keep the lines of communication open, check out these three simple tips that can make a big impact on streamlining communication and enhancing care. 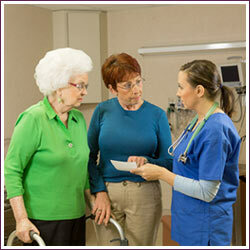 personal care, Alzheimer's care and more. Give your local office a call today to learn more about services available for your senior patients. "I've got some outside help. My husband's brother takes him for a weekly visit so I can get away. Once a week I have an aide come in who is mostly company for my husband and I can get out for a full day. I go see a movie usually and shop with one of my close friends. I feel so much better when I come back home." "We have two wonderful daughters and a super granddaughter and a (younger grandson who is very attentive to his Pop-Pop), that will come and stay with him so I can have a weekend away with my girlfriends at least once every six months! Our grandson is local and pops in all the time to check up on us! I am very grateful!" "Our extended family lives out of state, so I've learned to reach out to our faith family when I need help. Even if that means calling a friend from our church to come hang out on hard days while I make a quick grocery run, getting out of the house for a few minutes really helps. And the company is good for both of us." Also, sign up to receive our monthly newsletter Caring Connections®, a resource for those who care about seniors. Do you have an article, story or idea you’d like to us to feature in an upcoming issue? Email it to [email protected]. Program to work with seniors who live with these conditions. This world class curriculum is also available free to family caregivers online or through local Home Instead Senior Care offices. At Home Instead Senior Care, it's relationship before task, while continuing to provide superior quality service that enhances the lives of aging adults and their families.